Jaffna Message: There is a big thrust in the male lecturer on the woman who works as a lecturer in the university. 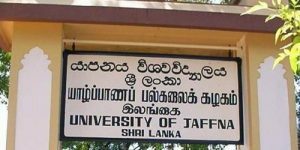 The incident took place yesterday afternoon at Jaffna University. Scientist computer lecturer has no reason to call the lecturer on the lecturer. This has caused tension in the university for a while. When our journalist asked the university students about this incident, he said that he was a mental patient.